Nevada City, the first jurisdiction in the county to start licensing medical marijuana businesses, has found the road somewhat rocky. A contentious debate surrounding the number of medical marijuana dispensaries in town was eventually settled last month, with Elevation 2477’ granted the license to become the city’s sole medical cannabis retailer. Applications also became available for medical cannabis businesses to operate on properties zoned for light industrial use. But those applications have been problematic as well, with the city trying to clarify setbacks and other issues, and with some neighbors expressing concerns. City Planner Amy Wolfson said in mid-February she had received six applications for cannabis businesses, in addition to two that were approved by the city’s Planning Commission in January. Four other prospective businesses had submitted zoning verification requests, Wolfson said. At Wednesday’s council meeting, cultivation size limits and the proximity of cannabis businesses to day care and/or youth centers were the topics of discussion. 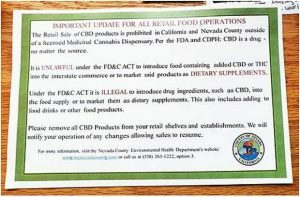 According to the staff report, Nevada City’s medical cannabis ordinance prohibits outdoor cultivation but does not provide any limit on the size of cultivation facilities. Mayor Duane Strawser said he brought the issue to city staff because he felt the issue needed to be clarified, even though no cultivation licenses have been requested. According to Strawser, he wanted to put the brakes on rumors that “giant” indoor grows were on the table for Nevada City. The proposed amendment to the ordinance would limit indoor cultivation to 2,500 square feet, which would be consistent with specialty cottage cultivation licenses. After discussion, however, the council agreed to prohibit indoor cultivation for now, subject to revision in a year. The proximity of cannabis businesses to dance and martial arts schools in the Seven Hills area also was hashed out. According to City Attorney Hal DeGraw, approval of any future applications for cultivation and dispensary businesses should require a 600-foot setback from day care centers or youth centers. But what constitutes a youth center, and whether that setback should be measured by property line or by storefront, needs to be clarified, Strawser said. Strawser said that he made an informal measurement from the future site of Elevation 2477’ to the dance and martial arts schools on Argall Way and Searls Avenue, and they were less than 600 feet away. 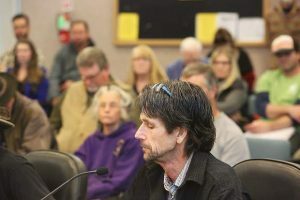 Jonathan Collier, of the Nevada County Cannabis Alliance, told the council that a 600-foot setback using property lines would mean a de facto ban on cannabis businesses in Nevada City. Using property lines would be impractical, Srawser agreed, noting that most municipalities were measuring setbacks from entrance to entrance. Strawser said he would not want to drop below a 600-foot setback, although he indicated a 10 percent exception could be made on a case-by-case basis. Council member Reinette Senum said 500 feet would work for her. No decisions were made Wednesday night. Staff was directed to bring back some options for amending the current ordinance to the next council meeting.